With Sellsy, you can display your custom fields right on your documents PDF. Any kind of custom field can be displayed. Two main features are available: custom fields display at the end of your documents, or displaying the products/services custom fields within your documents lines. 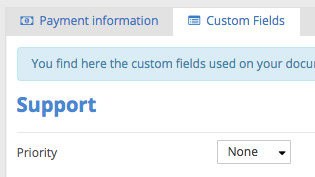 You can easily define the display of your custom from the custom fields settings by clicking on Display on PDF's. The field will be displayed by default on your documents from now on. The field is then displayed at the end of your document. You can also display custom fields like products at the end of your product description in your document rows. The custom field will be added to the description from now on. Warning: custom fields are added when the document is saved. They are not displayed during the document edition.